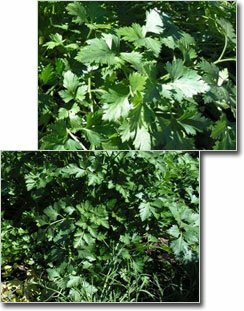 Italian (or flat-leaf) Parsley is an old favorite of mine, since the year I found volunteers popping up between the bricks of a walkway surrounding our raised beds. 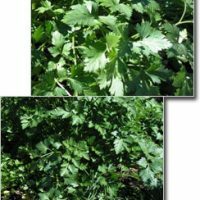 Besides having a much better flavor than Curled Parsley, it thrives in many different locations and suffers shade gladly. It nearly always blooms, makes seeds, and spreads itself around the garden in a truly generous fashion. If you haven’t already planted the Italian variety, add some to the curled cousin you put in during the fall to grace the edges of walks and beds around your place. When basil season comes along, Italian Parsley will be needed for making pesto — so plan ahead!